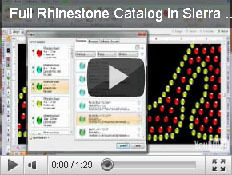 These are first class plugins for the rhinestone designs creation & editing. 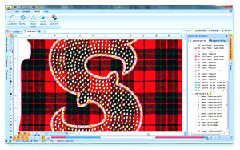 It contains all the necessary tools to digitize designs with rhinestone, rhinestuds & nailheads. Starting from raster graphics, vector files, or just creating designs on the fly. Among other digitizing tools, this plugins includes an advanced lettering system with pre-digitized fonts and it is also compatible with true type fonts. It has an amazing User Interface similar to the new Microsoft Office style with application button and context ribbon bars. The design process is very fast and easy, simulation using the realistic components from our huge library is great, and designs can be edited and personalized at any moment. 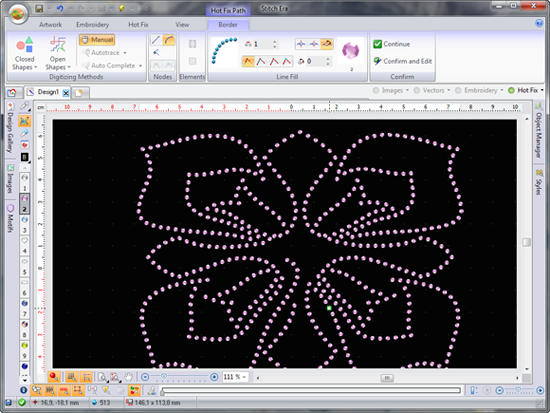 Designs can be exported to different motif machines. Please check the compatibility list before purchasing these plugins (if your machine is not in that list, we will try to develop the required driver). 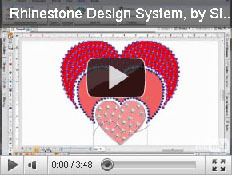 These amazing plugins are a stone (rhinestone, rhinestud, nailhead) specific plugins for the design creation, with output to different laser and vinyl cutters in order to produce design stencils or templates. Starting from any artwork captured by scanner, from third parties applications or from artwork files; this program is the fastest tool to convert those images into stone designs. 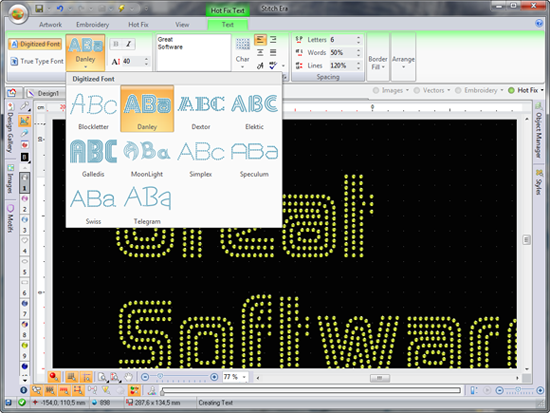 It includes several input methods and fill styles, and it also offers a complete lettering system. While your work is in process, an incredible design simulation displays a realistic sample of your designs. Digitizing takes only a few minutes and result is amazing! When the design is ready, it is only necessary to export it to the corresponding file format or output device. 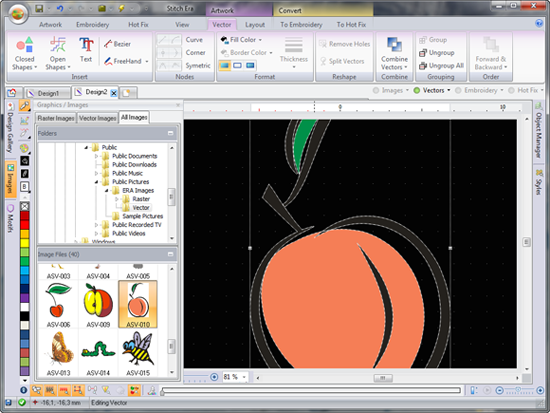 Designs can be exported to different cutting equipment. Please check the compatibility list before purchasing these plugins (if your cutting equipment is not in that list, we will try to develop the required driver). 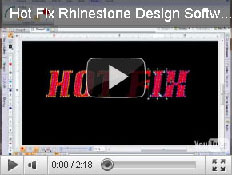 These plugins includes not only the most complete and innovative set of tools for the Rhinestone design creation; but it also contains a huge set of tools for graphic editing. Its features will let you create new designs quick and easy, combining automated functions with those who allow you to have precise control over each design element. 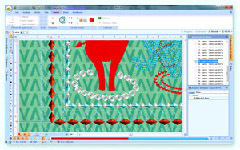 These plugins may import raster and vector graphic files on the most used file formats, it may capture raster images from scanners and vector files from other graphic applications too (as Corel Draw and Adobe Illustrator). 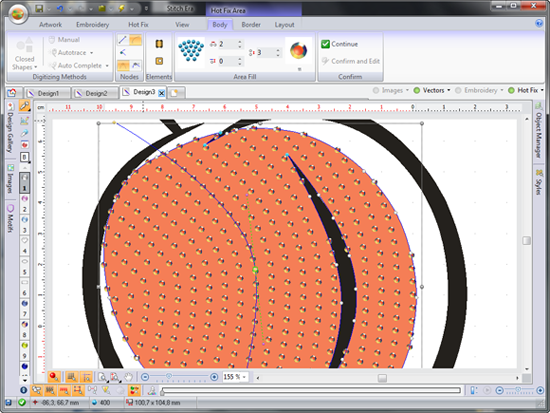 Raster Images (bitmap type) may be vectorized (converted to vectors) and all vector elements may be fully edited (block editing and node editing too). All the necessary tools are included in HOTFIX STONE. 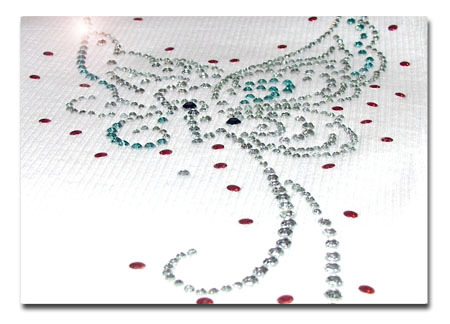 You will need no other separate applications to create and/or process rhinestone designs: modify and process pre-existing designs (edition, scaling, merging, etc. 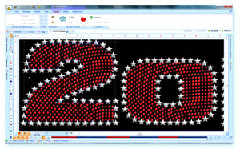 ), lettering system, object design, raster images, vector images, image processing and converting to rhinestone designs, automatic digitizing, manual digitizing, interactive digitizing, sample printout, etc. Please check the compatibility list before purchasing these plugins (if your equipment is not in that list, we will try to develop the required driver). Please check compatibility, according to your production method and your equipment, as you will need to purchase the proper plug-in for your machine. 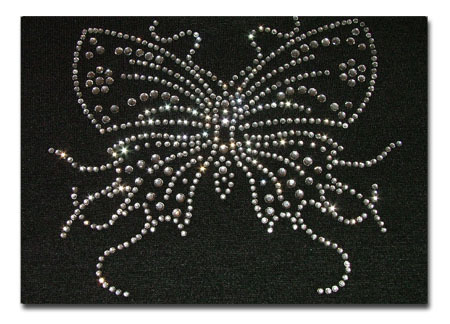 Rhinestone Stencil Making, on Laser Cutters, Vinyl Cutters of Engravers. 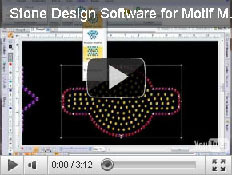 Rhinestone Motif Making (to transfer paper) on Automatic Motif Making Machines. 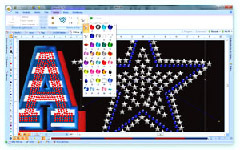 Rhinestone Motif Setting (direct to Garment) on Automatic Motif Setting Machines. HOT FIX outputs to many equipment brands and models. There are 2 add-on options for cutters. Before purchasing this product, you must test both of them to evaluate which is the right option for your equipment. You must first install the right windows driver provided by the equipment supplier (HOT FIX may exports designs through the proper manufacturer driver). 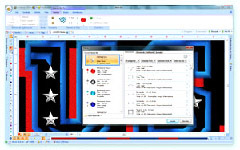 Option 1: Add-On Code RSM-CUT-61 Download, install and run the following testing software:Test Program If the result is successful, the software product will run accordingly. In this case get the driver: RSM-CUT-61. Option 2: Add-On Code RSM-PLT-61 Download the hpgl/plt file: File, and send it to the machine according to the machine manufacturer instructions. If the result is successful, the software product will run accordingly. In this case get the driver: RSM-PLT-61. If this requested test is skipped, no software returns because of compatibility reasons will be accepted. HOT FIX outputs to several equipment brands and models. Output file format depends on each machine model. Through the Machine Manufacturer Driver. You must first install the machine manufacturer original driver for windows to transfer designs. 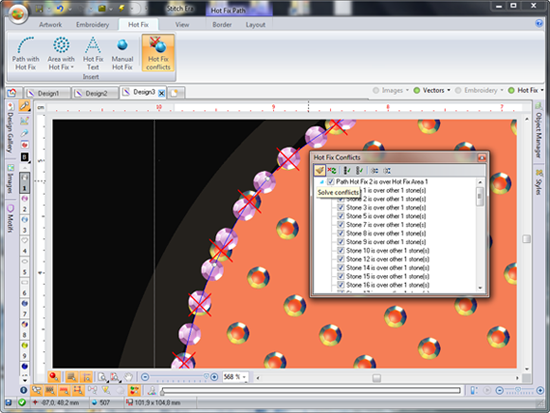 Through the Machine Manufacturer software. You must first install the machine manufacturer original program to transfer designs. Before purchasing this product, please download and test the bellow design files. Even when your machine is listed, as there are different machine models and generations, you must verify compatibility through the test of the provided files. If the result is successful, the software product will run accordingly. If this requested test is skipped, no software returns because of compatibility reasons will be accepted. Before purchasing this product, please download and test the bellow design files. Even when your machine is listed, as there are different machine models and generations, you must verify compatibility through the test of the provided files. If the result is successful, the software product will run accordingly. Do you have a machine which is not listed here? Please call us in order to develop the required plug-in! The product is updated frequently and without previous notice, because of which the screens shown here may not match the product�s latest version. Some image captures and animations may have been made over a different product and may show a different feature from the one that is intended to be shown, which may not be included in the product. Consult your vendor about the product�s features and/or the product than contains the desired features, before making its purchase. We recommend acquiring only the product�s latest version. We recommend acquiring the products from an authorized distributor. Legal notes - Site mapCopyright � 2019 � Sierra Technology Group S.A.